This week we needed a visual for a better sleeve with a taller cap. 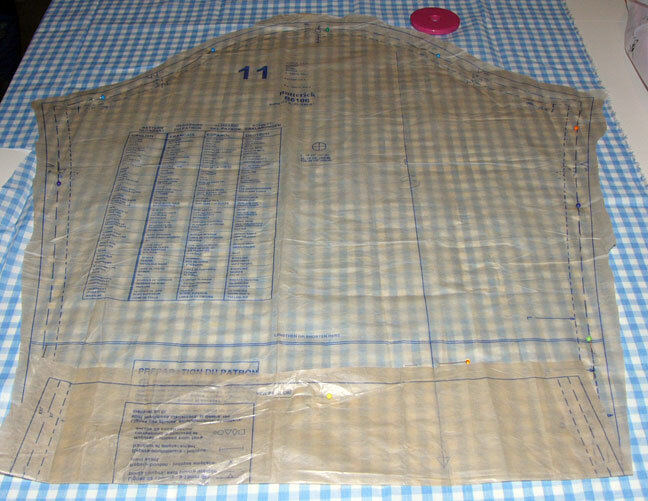 I placed the paper pattern down and traced the XL size along with the extra panel for fitting. The grain lines are drawn horizontally and vertically in black marker. 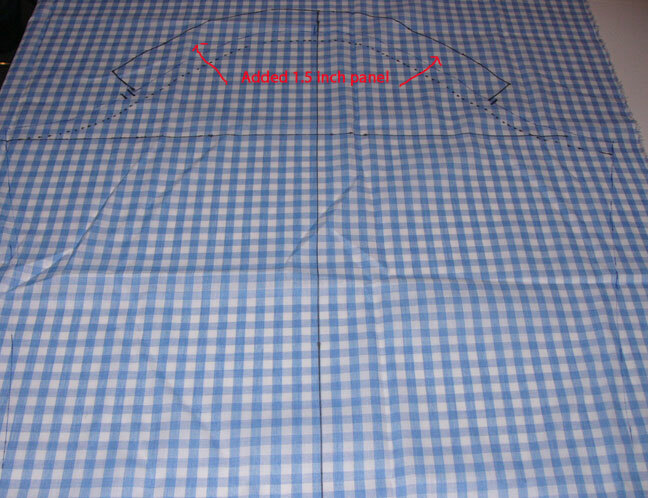 The stitching line for the XL is the dotted line at the top and the rest as they say…is gravy. If we need it, it is there, if we don’t it gets cut off…CL-TL. I pinned the lower half of the sleeve in the armhole from notch to notch and worked the rest of the sleeve with ease. 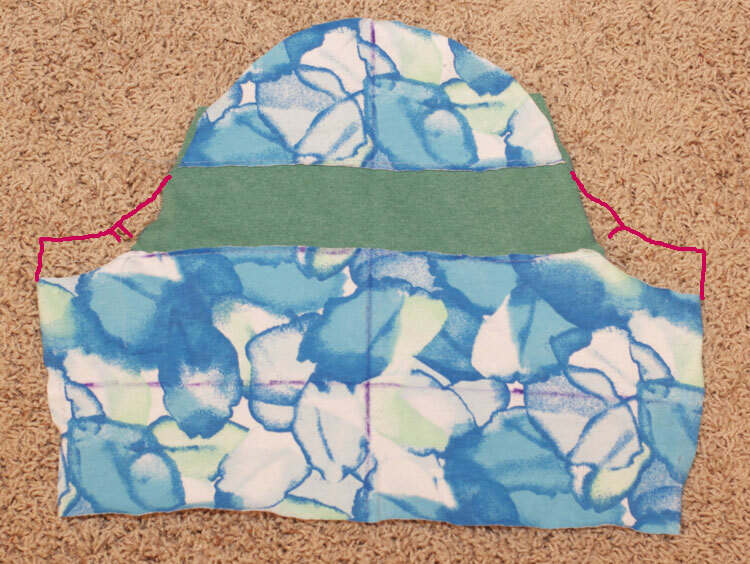 Then I used the XXL stitching line at the cap only to give extra height…about 1/2 inch more. Here is the sleeve machine basted: It is getting better with just that 1/2 extra don’t you think? But the bicep line still hikes up a bit. So what happened to the sleeve and the armhole? Dimensions please….. We went from 3/4 inch ease to 1 inch. Each sleeve cap section enlarged 1/8 inch so total 1/4 inch. Then I thought…in the very first photo last week it looked like 1 inch extra sleeve cap height would be good. I removed the sleeve, drew another seam line 1/2 inch higher up and basted it in. Adding a full inch added another 1/4 inch to the overall sleeve circumference so to reduce the ease below the cap and above the notches I pinned out and basted 1/2 inch (2 squares) all the way across. Now we have the original circumference with ease of .75 inch. While it looks like there are drag lines it is because there is no arm in the sleeve and it hangs flat. Is there anything else we can do besides that pinning out? Of course, as my grandma used to say, “there is more than one way to skin a cat”. In this previous photo you can see you can raise the curved sections up: You need to plan ahead for this as there is no extra fabric there once you have cut out the sleeve unless you want to make another muslin. Either way you are shortening the distance from the new cap line but still having a taller cap to eliminate drag lines and lay nicely over the shoulder bone. 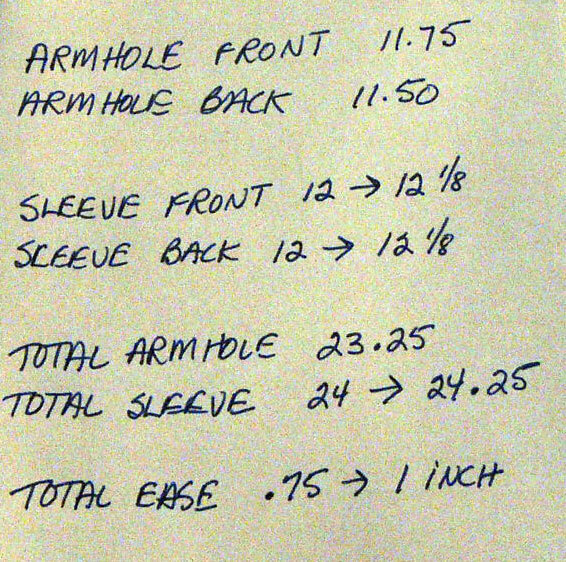 So for this pattern the real sleeve will be cut size XL with the cap cut for the XXL plus another 1/2 inch higher. The pinned area will be folded out of the paper pattern straight across. This is just my version of making this sleeve look better, you don’t have to try it or agree. But if you look back through some of Nancy’s other patterns we have done this over and over for wovens and knits. Next week, she returns from her vacation and we can get started on pinning and slashing this jacket. 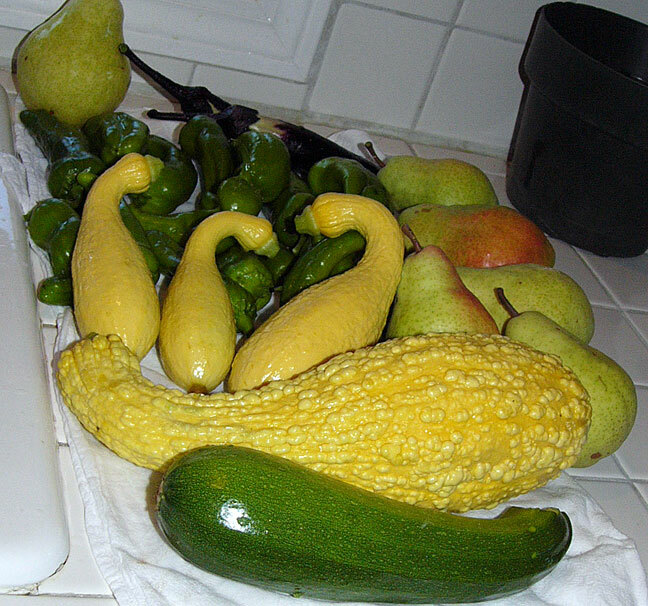 A sample of the garden produce this week…happy sewing everyone! This entry was posted in challenges and tagged adding to sleeve cap. Bookmark the permalink. Thanks for opening my eyes, when I didn’t realized they were shut! You were just squinting, Brenda…have fun with your next set of sleeves! Why do I suspect an entire career could be built based on fitting only sleeves? 🙂 Is it too narrow (front-to-back) of a sleeve cap that causes you to not be able to raise your arms? That’s one thing that’s haunted me for years, in fact I’ve totally avoided making long sleeve woven fabric blouses. Seriously. All because when I was in grade school, Mom made me a blouse and I could not raise my arms without the entire blouse hiking up too, and spent the day pulling it back down after I did. Now, I think I need to find that gingham I know is in the closet and start playing, instead of going right to garments. There is a story that once Coco Chanel was having lunch with a man and she asked him to raise his jacket arm. It pulled as you described and she told him that he needed to get a new tailor to raise his underarm up higher into the socket. So the engineering is important as well as the circumference. Back in the 80’s we wore the “Boyfriend Jacket” which was a nice word for badly fitting blazer with deep armholes…it was sloppy and when you raised your arms the whole jacket went with them. Armani tried to fix that and made better jackets in the 90’s. 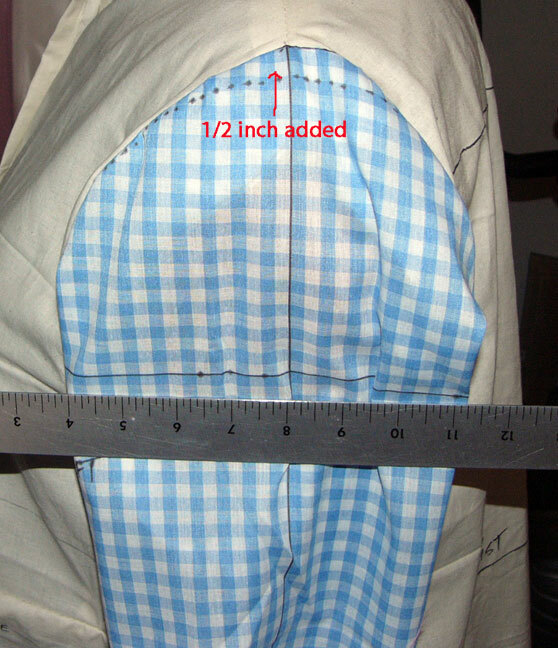 It is a battle to find the right fit but if you are determined and have a some gingham and measure and record you can get a better fit. Also what come into play is the bodice…if the sleeve has to borrow from the front and back armhole the sleeve will suffer. 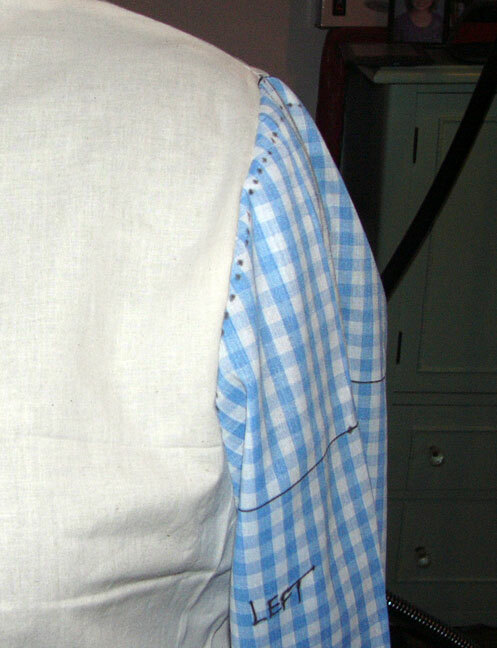 Make sure the stitching line (and notches area) of your bodice fall closer to the armhole both front and back. Think like a fitted sweater compared to a loose sweater…one has a closer fitting bodice and high armhole, the other droops down and away from the armhole. Good luck…send me photos as you go along and we can help each other. Oh yes Mrs Mole! You are just the business. I find your actual photos so helpful in understanding more. Your last response, mentioning Chanel, is just spot on. I am slightly disappointed tonight. I machine basted a dress and fitted it carefully. Now I have made it up I just find it a bit too big. I had no idea why. Then I remembered that I often try on over my clothes (well a T shirt, and perhaps my PJ bottoms), or maybe I have lost a few pounds, anyway its only a toile so I can get it right next time. I do find myself making things three or four times to get it just right. And your produce – the colours, the artistic arrangement – wonderful. Oh Kate…you crack me up…trying on clothes over your pajamas! Do you have any wadders to share for a SEW BAD Saturday treat? I think the veggies arranged themselves after they were bathed in soapy water…the big crookneck was such a bully he pushed everyone to the back so he could be the star. Later he got his seeds removed and was chopped up for dinner. Happy Days, Angela! Good luck with the first pattern you try! Send us a photo! I have noticed that Burda patterns do seem to have better fitting sleeves right from the start, and they also allow for a better fitting bust. A little less work slicing and dicing the muslin! Back in the 80’s when Burda did not have seam allowances, their pants fit better as well since their back crotch length was longer than the front while US patterns were more equal front and back. I have a lot of them from back then and wish I had more time to play with them and use more modern fabrics. The coat I made last year and posted was a Burda from the 80’s…way more style than what we can find today. Wouldn’t it be nice to find a bodice that was larger than a B cup to start with? This post is so helpful. It got me wondering about raglan sleeves though. Would one get a good fit using a dart somehow? I must get some gingham to experiment with. 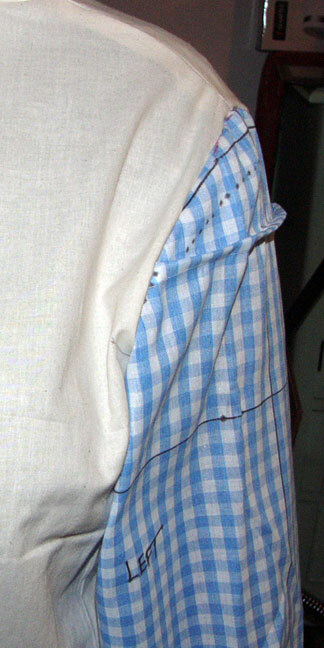 Some raglan sleeves are one piece and some are two piece. I’m betting the 2 piece ones fit better because they are more adjustable. One piece ones may or may not have a dart which can help to a point. Like you say…get some gingham and try them out…you may find that you don’t even like the way they fit or don’t fit your shoulders. I had a teacher once who told me…”Raglan sleeves…don’t flatter anyone…they make sloped narrow shoulders worse and they make broad square shoulders look wider”…so avoid them at all times…ha ha The front raglan armhole seam also draws the eye downward and out making the bust seem more matronly…so I have never made friends with them. This post is old, so I hope it isn’t too late to ask a question! I recently realized that I need a higher sleeve cap – I’d been reducing the height of the cap to try and increase arm mobility. I measured that I needed to add 1″ to the cap height to get my bicep line straight. 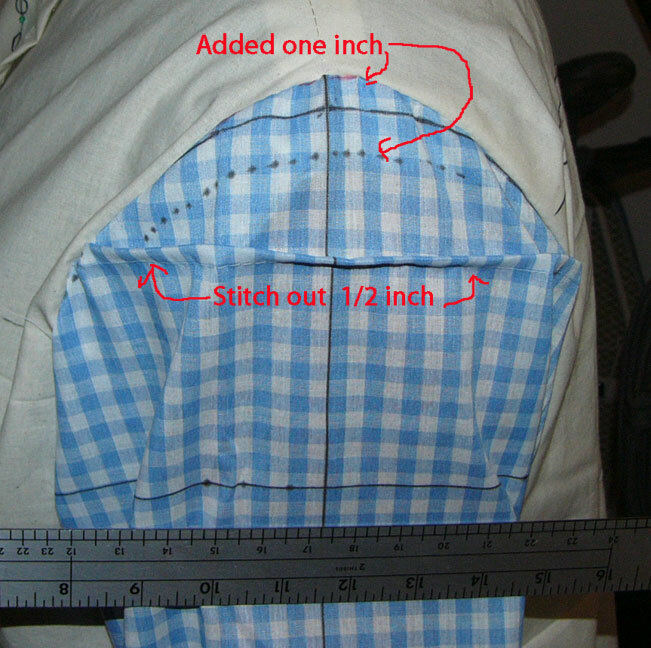 On the pattern, I added 1″ to the cap height and then I removed a tuck to return the sleeve ease to the original size. My question is: once I take out the tuck (below the cap but above the notches) the final cap height isn’t 1″ taller than my original sleeve cap anymore. Is that what is supposed to happen, or am I missing something?